I exhibited ‘Happiness I’ at the HIDE exhibition at Piccadilly Place in Manchester 1st-6th June 2012. Hidden for most of the time it’s meaning came out only once in the sunlight but, alas, was not caught on camera. 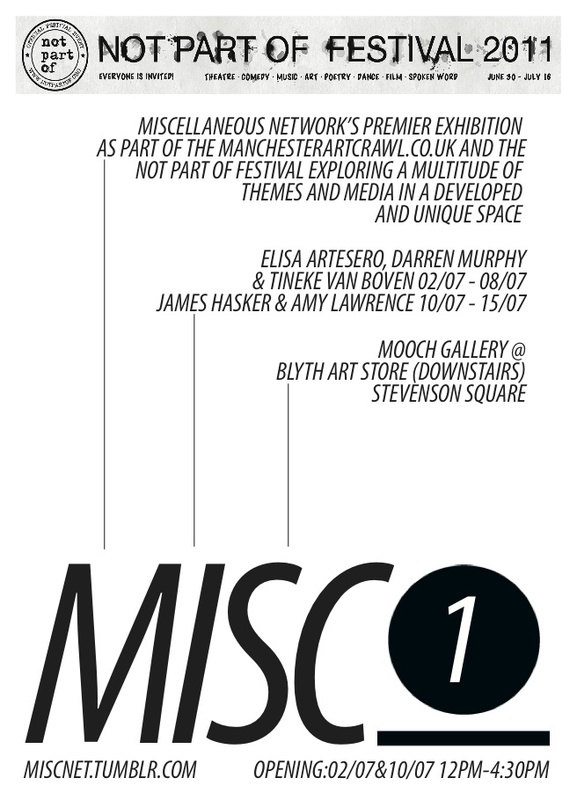 Saturday 2nd July is the preview of an exhibition with work from some artists in the recently formed Miscellaneous Network. Misc.1 at the Mooch Gallery at Blyth Art Store in Manchester is part of the Manchester Art Crawl and Not Part Of Festival. The exhibition is split into two weeks in order to showcase more artists in the Network; I will be exhibiting in the first week (2nd- 9th July) with Darren Murphy and Tinkeke Van Boven, and the second week (10th- 16th July) will showcase work from Amy Lawrence and James Hasker. Expect an eclectic mix of work from the conceptual to the graphic, drawn and photographic. I will present some of my Wire in the Glass series, lovingly framed to make the best of the work.